Some of the redundant workers gathered outside of the East Demerara Estate yesterday morning as the meeting between the former sugar employees and the government, GuySuCo and NICIL officials was ongoing. 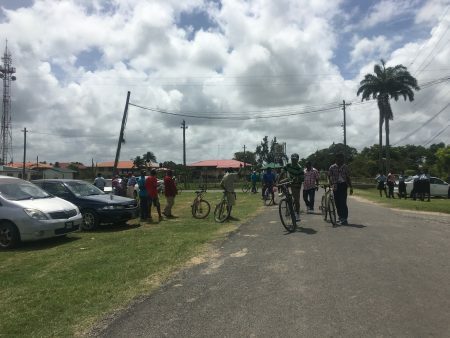 A high-level ministerial team yesterday told dozens of former Enmore sugar workers that they will begin receiving severance pay from Monday and discussions are also underway to find a buyer for the East Demerara Estate (EDE) that could keep it going. Since being made redundant by the Guyana Sugar Corporation (GuySuCo) at the end of December 2017, hundreds of sugar workers have been agitating across the country for their full severance pay and the government has been criticised for not budgeting adequately and meeting the workers to discuss the way forward. 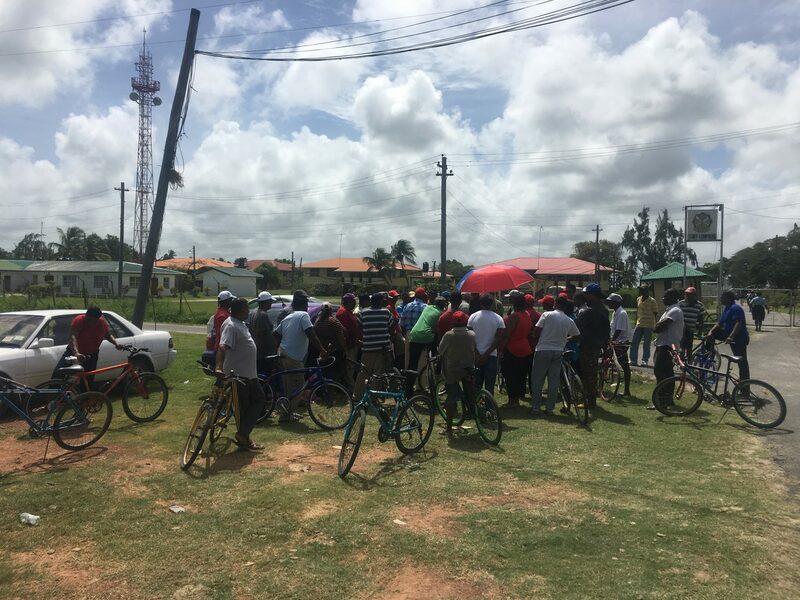 With dozens of workers protesting outside of the Enmore complex while others sat inside, Gaskin announced that the payment of severance would begin from Monday and that the workers were not being abandoned by the government. This announcement was greeted by cheers from a majority of the workers who had been unsure when severance payments would begin. At the EDE, 1,480 workers were made redundant at the end of 2017 and the majority are from Enmore and its environs. “You have not been abandoned. Regardless of who employs you or where you are employed, as long as you are employed in Guyana, you have certain basic rights. As a government, we value the working people of Guyana. The work you do has value. It is not the fault of the workers that GuySuCo has found itself in trouble. Bad decisions, bad investment, bad leadership and bad management have brought GuySuCo to where it is today. Between Monday, Tuesday and Wednesday, the monies earmarked for severance will be paid out,” Gaskin told the workers. To bolster the government’s position that the retrenched workers were not being abandoned, Shawn Persaud of the Special Purpose Unit (SPU), which was created under NICIL to oversee the privatisation/divestment of sugar assets, announced that they are currently trying to source a buyer for the Enmore estate, in a bid to keep it running alongside the Uitvlugt, Albion and Blairmont estates. He noted that while the process will not happen overnight, they are currently pushing to keep the estates going. So far, Persaud said, they have received over 70 expressions of interest from local and foreign investors who are interested in running the estates. The Private Sector Commission and Demerara Distillers Limited have signaled interest in the EDE. 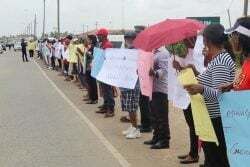 Prior to the meeting being held yesterday, hundreds of workers assembled along the road leading to the entrance of the EDE armed with placards. They bore the brunt of the morning sun to air their views on the situation. A major contention of the workers is the government plan to pay severance in two parts—the full amount at the end of this month to those who are entitled to under $500,000 and half for all the other workers by the end of January and the remainder at some point in the second half of the year. “We don’t want 50 percent of our money. We want we full severance, not half. When the next half coming? We nah know. Me phone cut out and they come and tell me I have to pay $10,000 to put it back on but I leff it just so since then cause me ain’t got money to pay,” Dindial Persaud, one of the former workers, related to Stabroek News yesterday. “I give this industry 21 years of me life. Since I was 18 I come here and work. It was me first job as a cane cutter and I never leff. I been here all that time and since we get lay off last year I ain’t find another job since. I riding around all over, from Enmore to Enterprise to Foulis and I still can’t find another job and they want come and give me half now and half God knows when,” Darvendra Deonauth said, while emphasising that he is calling on the government to ensure that the workers are paid their full severance. Other workers present also lamented that they have been unable to find jobs since they were laid of last year and have experienced a “miserable Christmas and new year.” They said that even after they receive “some money” from the sugar corporation they were unsure how long they will be able to survive without employment. “They already breaking the law by not giving we we money from the time they knock we off and now they want to control when we get it and how much we getting. That’s not fair, that is not fair at all. People got children and wives and home to take care of. People can’t get some of dey money now and unsure of when they getting the next set. Is not fair, we need all now,” another worker argued. Workers who are entitled to severance pay of $500,000 and under will be paid in full, while those who are entitled to payment of over $500,000 will receive 50% next week and the other half by the end of the year. Similar meetings were held yesterday by Prime Minister Moses Nagamootoo, Minister of Agriculture Noel Holder and other representatives from the government with former sugar workers in Rose Hall, Canje and Skeldon. Two weeks ago, a supplementary allocation of $1.93 billion was approved in Parliament to enable the payment of severance, after Minister of State Joseph Harmon had indicated that only $500 million was earmarked in the 2018 budget for the workers’ severance payment.